Air fryers seem to be on everyone’s wish list when it comes to kitchen appliances. And I will admit, they are handy. 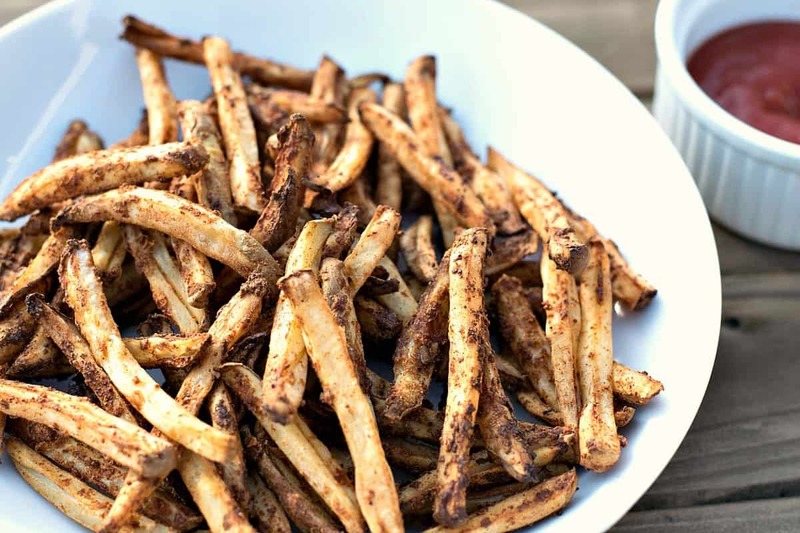 For instance I can make a batch of these oil-free, Air Fryer French Fries in just over 20 minutes! Crispy French Fries, using no oil, and ready in minutes? Now that’s cool. Don’t get me wrong, my original Oven Baked French Fries Recipe is still my most poplar recipe to date and will work just fine for making homemade Fat-Free French Fries. Wash and scrub the potatoes. Bring a pot of cold water to boil (this takes 10-15 minutes). And they are some of THE best fries ever, but we dirty 2 pans, and have to wait about 45 minutes before we can dig in. 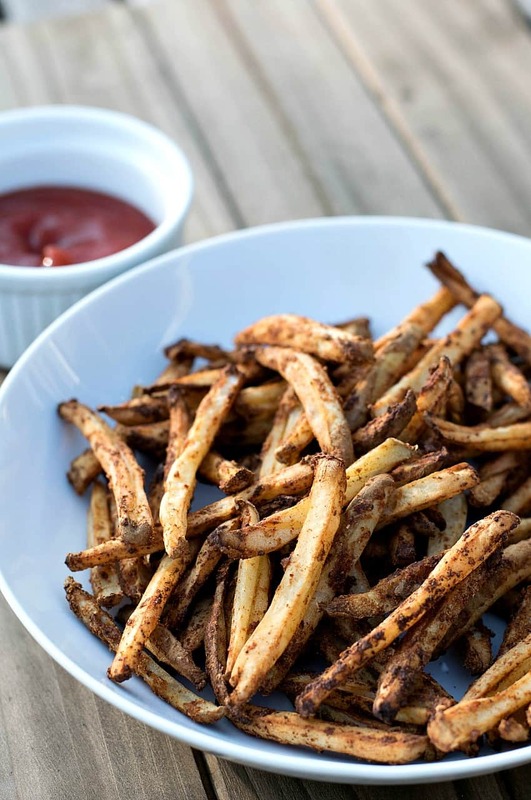 With these Air Fryer French Fries, we simply wash & slice, and then shake & bake. There’s no reason to boil anymore, and the fries are seasoned in a large ziplock baggie for easy cleanup. Just dump your perfectly seasoned fries directly into your air fryer and press a button. Bam, 23 minutes later you have crispy little nuggets of potato goodness waiting for you, and only 1 pan to clean. So if you already have an Air Fryer – let’s get to the recipe. And if you don’t…. (but WANT one)…. I’ll post my Affiliate Link to my Amazon Store where you can buy one. Remember affiliate links mean I get paid a little commission on every sale. Here’s a link to Brandnewvegan’s Amazon Store. Or you can continue to bake my original Oven Baked French Fries Recipe the old-fashioned way. And that’s ok too. Two medium Russet Potatoes will make about 1 serving of fries, so adjust accordingly. Wash and scrub the potatoes and rinse well. Then slice them into small strips. For the fries in the photo I used my Mandoline Slicer with the ½” julienne blade. The smaller they are the more they crisp up. Place all the cut fries directly into a large ziplock baggie. Add 1 Tbs of Low Sodium Soy Sauce to the fries and shake to distribute. This does 2 things: it adds a small amount of sodium, and it give the seasoning something to stick to. Now add the flour and seasoning. GF flour is fine if you’re gluten intolerant, but don’t completely skip the flour step, it adds to the crispness. For the seasoning I use 1 tsp Onion Powder, 1 tsp Garlic Powder, 1 tsp Paprika, and 1 tsp Chili Powder. Give them a good pinch of Black Pepper and shake to distribute the seasoning evenly. Now just plop the fries into the basket of your Air Fryer, set the temp to 390°, and the time for 25 minutes. That’s really it. Every so often pull the basket out and give the fries a good shake (I recommend doing this over the sink as some of the seasoning does shake off). Start checking your fries about the 20 minute mark for crispness. With my NuWave Air Fryer, the fries in the photo were done at 23 minutes. A lot of you have already asked me about Air Fryers and whether they are a good investment. All I can say is I use mine a lot more than I thought I would and….if you eat a lot of potatoes (or fries) then yes they do make it easier. I listed a few popular ones on my Amazon page or check your local department store for sales. Have fun and happy air frying. Some of the tastiest and crispiest French Fries ever (without using a single drop of oil). How did I do it? My brand new Air Fryer! Your favorite French Fries just became a whole lot easier! Scrub and wash the potatoes. Slice potatoes into 1/2" french fry strips. I used a Mandoline Slicer with the julienne blade. Place fries into a large ziplock baggie and add soy sauce. Shake to distribute. Add flour and seasoning to bag and shake to distribute. Place fries into Air Fryer basket, set temp to 390 degrees, and time for 25 minutes. Press start. Remove air fryer basket occasionally to shake and redistribute fries. Here's a link to my original Oven Baked Fries Recipe, no air fryer required. Hi! I noticed on your Amazon page you show 2 air dryers. Which one do you prefer. Thanks! I used 2 potatoes. I used Braggs liquid amigos. I used cassava flour. All measurements were the same as listed. I did stop cooking with 4 minutes to go. They were a smidge burned. I also thought the fries to were to skinny for me. The flavor was great. I liked the coating. Thank you for tastiness. Fantastic fries. Only took about 20 minutes in my Breville air fryer smart oven. Delicious!